The Off the Mark-et set is printed. Thanks everyone who ordered! Please be patient. Soon I will start on the sketch cards. Below is a pic. I'm very happy with how these came out, and I added a couple more. It looks really good. Thanks! PPPPPLEASE Bring the to Allentown! This would indeed be a wonderful peek into a truly creative and talented mind! I'm lucky because I get to use my rejects in my Off the Mark comic panel. But for me, there's nothing like seeing them in card form! I've done most of these years ago, and have seen them over and over, but when I now see them in a card set, I geek out. Not until we have them, please!! 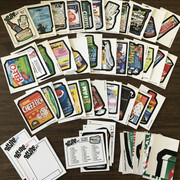 This set being offered to Forum members is such a great example of this forum working so well to help this hobby flourish in spite of Topps lack of interest.